A columbarium is a structure designed to hold the cremated remains of the deceased in a consecrated area of the church or surrounding grounds. The word columbarium comes from the Latin and translates broadly as "dovecote," the compartmented housing for doves. In many churches the columbarium is a collection of niches installed in the church walls. 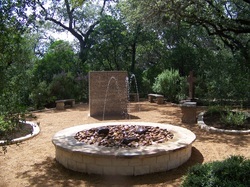 In other churches, such as St. Francis by the Lake, the columbarium is on the church grounds. Burial within a church or in the adjacent churchyard maintains a long tradition in Christianity. The St. Francis by the Lake Garden Columbarium has a choice of two types of structures. The original is a cubiform structure of rose colored Texas marble measuring about 29 by 54 inches at the base and it is about 63 inches tall. It contains 52 niches; each niche can hold two urns. Each urn holds the ashes of one individual. The cost of this urn is included in the price of the niche and no other container is needed. Each niche will be engraved with the names of the deceased and their date of birth and death. St. Francis by the Lake also has the beautiful Garden of Eden, which consists of in-ground niches which can hold up to four urns per niche. The columbarium is in a wooded area just north of the church building. It is the final resting place in the church home for parishioners and their family members. As such it offers a place for prayer and meditation, especially when family or friends gather for worship or other church visits. 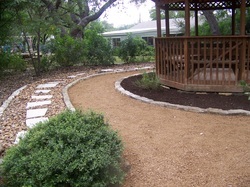 The area surrounding the columbarium has been landscaped to create a dignified garden setting under sheltering oak trees. Perpetual care is provided. Cremation, which has a long history among many peoples, is practiced today by a majority of the world's populations, either by custom or law. The practice has grown slowly in the United States, however. But as populations and urban areas have burgeoned, burial space has become increasingly restricted. The early churchyard burial ground has given way to cemeteries that are a distance from church and home. Even now, land shortages, land use restrictions and health considerations are forestalling the establishment of new cemeteries in some areas. Within the Episcopal faith, the National Church supports cremation. When our earthly bodies are no longer needed, they may be laid to rest in any respectful manner. In death as in life, we remain in God's hands. At the time of death (preferably earlier), arrangements for cremation can be made with a funeral director who will counsel family members on procedures. The five crematories in San Antonio are located in cemeteries, not in mortuaries. State law now requires a properly drawn declaration by the individual stating his or her wishes for cremation. This document can be part of a will, or given to the individual(s) who will make final arrangements. If the declaration is not completed before death, approval for cremation will be required from the closest next of kin. A Columbarium Trust, appointed by the vestry, manages the funds for the columbarium and ensures its maintenance. A portion of the purchase price for each niche is reserved for perpetual care. The Trust has determined that no materials other than the container and its ashes shall be placed inside the vault, and no adornments such as flowers, flags or other ornaments shall be placed outside, except as provided by the church. 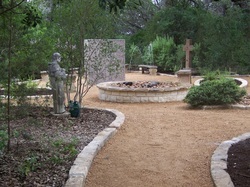 St. Francis by the Lake Garden Columbarium vaults are now available. For information about purchase for parishioners and family members, please call the church office, (830) 964-3820.